Publicly available services that are provided by Windows machines (HTTP, FTP, POP3, etc.) can be monitored easily by following the documentation on monitoring publicly available services. Note: These instructions assume that you've installed Nagios according to the guickstart guides for Fedora, OpenSuse or Ubuntu. The sample configuration entries below reference objects that are defined in the sample config files (commands.cfg, templates.cfg, etc.) that are installed if you follow the quickstart. For this example, we will be installing the NSClient++ addon on the Windows machine and using the check_nt plugin to communicate with the NSClient++ addon. The check_nt plugin should already be installed on the Nagios server if you followed the quickstart guide. Other Windows agents (like NC_Net) could be used instead of NSClient++ if you wish - provided you change command and service definitions, etc. a bit. For the sake of simplicity I will only cover using the NSClient++ addon in these instructions. A check_nt command definition has been added to the commands.cfg file. This allows you to use the check_nt plugin to monitor Window services. A Windows server host template (called windows-server) has already been created in the templates.cfg file. This allows you to add new Windows host definitions in a simple manner. The above-mentioned config files can be found in the /usr/local/nagios/etc/objects/ directory. You can modify the definitions in these and other definitions to suit your needs better if you'd like. However, I'd recommend waiting until you're more familiar with configuring Nagios before doing so. For the time being, just follow the directions outlined below and you'll be monitoring your Windows boxes in no time. The first time you configure Nagios to monitor a Windows machine, you'll need to do a bit of extra work. Remember, you only need to do this for the *first* Windows machine you monitor. What did you just do? You told Nagios to look to the /usr/local/nagios/etc/objects/windows.cfg to find additional object definitions. That's where you'll be adding Windows host and service definitions. That configuration file already contains some sample host, hostgroup, and service definitions. For the *first* Windows machine you monitor, you can simply modify the sample host and service definitions in that file, rather than creating new ones. Before you can begin monitoring private services and attributes of Windows machines, you'll need to install an agent on those machines. I recommend using the NSClient++ addon, which can be found at http://sourceforge.net/projects/nscplus. These instructions will take you through a basic installation of the NSClient++ addon, as well as the configuration of Nagios for monitoring the Windows machine. 6. 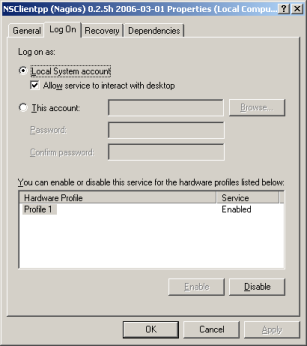 Open the services manager and make sure the NSClientpp service is allowed to interact with the desktop (see the 'Log On' tab of the services manager). If it isn't already allowed to interact with the desktop, check the box to allow it to. Optionally require a password for clients by changing the 'password' option in the [Settings] section. Uncomment the 'allowed_hosts' option in the [Settings] section. Add the IP address of the Nagios server to this line, or leave it blank to allow all hosts to connect. Make sure the 'port' option in the [NSClient] section is uncommented and set to '12489' (the default port). 9. If installed properly, a new icon should appear in your system tray. It will be a yellow circle with a black 'M' inside. Now it's time to define some object definitions in your Nagios configuration files in order to monitor the new Windows machine. Open the windows.cfg file for editing. Add a new host definition for the Windows machine that you're going to monitor. If this is the *first* Windows machine you're monitoring, you can simply modify the sample host definition in windows.cfg. Change the host_name, alias, and address fields to appropriate values for the Windows box. Good. Now you can add some service definitions (to the same configuration file) in order to tell Nagios to monitor different aspects of the Windows machine. If this is the *first* Windows machine you're monitoring, you can simply modify the sample service definitions in windows.cfg. Note: Replace "winserver" in the example definitions below with the name you specified in the host_name directive of the host definition you just added. Add the following service definition to monitor the version of the NSClient++ addon that is running on the Windows server. This is useful when it comes time to upgrade your Windows servers to a newer version of the addon, as you'll be able to tell which Windows machines still need to be upgraded to the latest version of NSClient++. That's it for now. You've added some basic services that should be monitored on the Windows box. Save the configuration file. If you specified a password in the NSClient++ configuration file on the Windows machine, you'll need to modify the check_nt command definition to include the password. Open the commands.cfg file for editing. You're done with modifying the Nagios configuration, so you'll need to verify your configuration files and restart Nagios.